An exquisite film which was made in association with Robert MacFarlane, author of the modern classic 'Mountains of the Mind', and narrated by Willem Dafoe. It is on iPlayer for a limited time. Jaw-dropping exploration of our obsessions with high places and how they have come to capture our imagination. Only three centuries ago, climbing a mountain would have been considered close to lunacy. The idea scarcely existed that wild landscapes might hold any sort of attraction. Peaks were places of peril, not beauty. Why, then, are we now drawn to mountains? 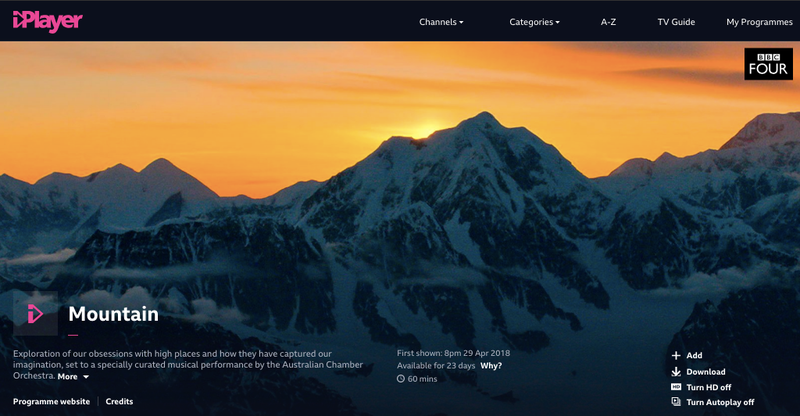 Filmed by the world's leading high-altitude cinematographers and set to a specially curated musical performance by the Australian Chamber Orchestra, Mountain captures the fierce beauty of some of the world's most treacherous landscapes and the awe they inspire.